I'm pleased to welcome Mike Martin to Cozy Up With Kathy today. Mike writes the Sgt. Windflower Mystery series. 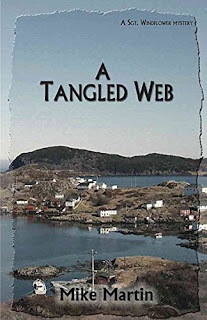 A Tangled Web is the sixth book in the series. Kathy: Sgt. Windflower is a Mountie in Grand Bank, Newfoundland.What makes the Mountie such an iconic symbol? MM: A Mountie is a member of Canada’s national police force, the Royal Canadian Mounted Police. They were the original police in the old Canadian western frontier and remain a beloved symbol of Canada. They still provide basic police services to thousands of small Canadian communities, like Grand Bank where Sgt. Windflower is stationed. Kathy: Although Sgt Windflower is an active member of law enforcement, you chose to make his series a cozy instead of a police procedural. Why did you choose that direction? MM: I find the procedures too technical and hard to follow and it really isn’t me. I am a story teller and the cozy or traditional model suits me and my style of storytelling much better. MM: I am not the main cozy person in my household. My partner, Joan is the cozy lover and she is the one who introduced me. I love the small town feel and the light, but intriguing style of the genre. MM: The Sgt. Windflower Mystery Series is set in small communities in Newfoundland, on the easternmost tip of Canada. It features a Cree RCMP officer, Sgt. Winston Windflower who is from far away and stationed in Grand Bank. It follows his adventures as he explores the food, culture, history and traditions in this part of the world. And he falls in love, with a two legged female and a four-legged one as well. MM: I love Windflower. But my favorite character is actually his partner and wife, Sheila Hillier. She is her own woman, a successful business person and the Mayor of Grand Bank. She is teaching Windflower (and me) about love and relationships. I am always interested to see where Shelia will go next. MM: I always wanted to write something that featured my home province, Newfoundland, and when I was visiting Grand Bank the idea came to me about this series. Actually, it was like Sgt. Windflower walked out of the fog and started talking to me. I just wrote down his story. And he’s still talking!! MM: I wanted to have a real book out in the world. I have always been a writer, of some sorts. But it didn’t feel real until I actually published the first book in the series, The Walker on the Cape. I guess that’s why people talk about realizing their dream. Because that became real for me. MM: I would invite JK Rowling because I think she is so cool, Stephen King to talk about writing. And JRR Tolkien and Charles Dickens just to listen. MM: I am reading Louise Penny’s new book Glass Houses. But so is most of the world right now!! MM: I like to walk, cycle and exercise. I am also a huge Ottawa Senators hockey fan and I love baseball. MM: Apples, several varieties of cheese, soup and crackers. I can survive the nuclear war for at least a few days. MM: I am currently pitching a new mystery series called Curveball that centered on minor league baseball. MM: I am blessed to have people take the time to read my books. That is the gift that readers give to me and I am very grateful for that. The Walker on the Cape was his first full fiction book and the premiere of the Sgt. Windflower Mystery Series . Other books in the series include The Body on the T, Beneath the Surface, A Twist of Fortune, and A Long Ways from Home. I'm currently reading A Murder for the Books by Victoria Gilbert. This book is the first in the Blue Ridge Library Mystery series and will be released December 12th. Taylordsford is a small Virginian town built on old families and secrets. Fleeing a disastrous breakup Amy Webber left the academic library of Clarion University and has come to live with her aunt and work as director for the town's public library. Although vowing to keep good looking artistic men at bay, Amy can't help but be intrigued by her neighbor's research, looking into an old town mystery. Instead of archival documents, however, they find the murdered body of an elderly patron. Who would want to kill the harmless woman? Was it a passing stranger? As Amy and Richard explore a mystery from the past they uncover secrets that may be deadly in the present. I'm pleased to welcome Mary Cunningham to the blog today. Mary writes the Andi Anna Jones Mystery series. Margaritas, Mayhem, and Murder is the first book in the series and will released this Thursday! Kathy: In Margaritas, Mayhem, and Murder travel agent Anna Jones books a cruise to Cancun for her father's widow. Have you ever been on a cruise? MC: Several! Like protagonist, Andi, I was a travel agent in Miami and was able to “preview” a few short cruises at very little expense. My favorite all-time was a cruise my husband and I took on a small ship line called the Dolphin. Unlike the floating cities of today, this one really gave you the experience of being on the ocean. (Dramamine was a necessity!) There were only about 600 passengers and while they had a casino and nightly entertainment, we had a chance to enjoy a true cruising experience and relax. I loved it. Kathy: Are you an armchair traveler, or do you enjoy actually visiting other places? MC: I used to love traveling more than I do now. We’ve lived in 9 different locations, so experience different locales, food, people, came naturally. I do find the older I get the more hassle it is to live out of a suitcase. We still travel, but only short trips in which we can take our sweet rescue dog, Lucy. We have no relatives living close enough to keep her and a kennel, no matter how luxurious, isn’t an option. I’m not sure how much Lucy would miss us, but we’d sure miss her! Still, it’s always exciting to visit new places and to visit the kids and grandkids. Kathy: Are you a fan or margaritas and/or Mariachi bands? MC: Definitely margaritas! On the rocks, thank you very much…with a salt rim. And while I enjoy Mariachi music, my favorite “traveling” music is the Louisiana Cajun sound. We lived near New Orleans for a year, during which I gained ten pounds! My heritage is French, so that may be why I felt so at home in the Bayou. Maybe I lived there in a past life? Who knows? MC: I wasn’t so sure what the Andi Anna Jones mysteries would be when I began writing them. I just wrote what I hoped would be, a fun, fast-paced mystery with unforgettable characters. Now I am drawn to the genre. I can’t count how many cozy mysteries I’ve read this year and how many new cozy author/friends I’ve made. My only complaint is that I didn’t begin writing cozy mysteries years ago! MC: I started out with a co-written non-fiction women’s humor book, WOOF: Women Only Over Fifty; a selection of stories, poems, and advice to help laugh your way through the aging process. A recurring dream I’d had for twenty-plus years about a mysterious attic led to my five-book, middle-grade time-travel/mysteries series, Cynthia’s Attic. I also have another middle-grade/young adult series in process, The Adventures of Max & Maddie. In my “spare time” (Ha! ), I’m writing a biography for a former military brat/college and WNBA basketball player and the foundation she set up to benefit the children of deployed military. This is a real challenge since I’ve never written a full bio before; just family memoirs. The Andi Anna Jones series begins with Andi, a mediocre travel agent, with an inferiority complex about her job, her looks, and her single status, discovering her "inner sleuth" when forced to fly to Cancun after her dad's widow is arrested for the murder of a has-been lounge singer. She soon discovers her talent to flesh out clues and solve mysteries far surpasses her ability to book vacations and handle complaints from unhappy clients. In the middle-grade series, Cynthia’s Attic, magical costumes, disappearing stairs and a spooky attic filled with dusty antiques provide two, adventurous, young girls more than they ask for. Best friends, Cynthia and Gus as she prefers to be called, are as "different as bubble gum and broccoli." They are, however, equal in their ability to get into trouble without much effort. In trying to escape the "boring summer" of 1964, the adventurous twelve-year-old girls stumble upon a trunk in Cynthia's attic that has been in her family for three generations. MC: Right now, Andi Anna Jones is my favorite character; possibly because I see a lot of her in me. Or, maybe I just wish I could be as adventurous as she; although, like me, she has her vulnerable side. She has a great sense of humor, doesn’t take herself too seriously, and is a flawed, but kind-hearted young woman with an indomitable spirit. MC: As mentioned above, I was a travel agent for about a year. Why just a year? Because I was terrible!! I faked my way through those awful months with the help of a co-worker. I still wonder whether she helped me out of the goodness of her heart or figured it was easier to help me get it right the first time rather than having to correct all my mistakes later. For whatever reason, Andi’s assistant, Ellie, is loosely-based on my “savior” in Florida. MC: Like most writers, I have a certain amount of ego that requires reading my words in actual print. Oh, sure, the joy of writing is paramount, but I’d be lying if I said I didn’t enjoy the thrill of seeing the book cover with the title and my name splashed across the front! It’s also very satisfying when readers and peers enjoy my stories, humor, and voice. I get the most satisfaction, however, inspiring young readers to write! MC: I’d love to talk to JK Rowling since Harry Potter gave me the motivation to write my first children’s series. I’m fascinated by the fact that she seems so down-to-earth while having such creative stories and characters spinning around in her head. JRR Tolkien is another simply because Lord of the Rings has always been a favorite. What must his mind have been like to keep all those characters straight! Mystery writer, Louise Penny is another. I imagine gathering incomparable advice and inspiration from her! I’d also love to sit down with Stephen King. To be able to pick the brain of the author who wrote Salem’s Lot, Carrie, and The Shining, along with emotional stories like Shawshank Redemption and The Green Mile, would be an incredible experience. MC: Just started Say Goodbye for Now, by Catherine Ryan Hyde. I just finished a couple of cozy mysteries, Howling at the Moon, by Karen MacInerney and The Big Chili by Julia Buckley. Several others from my favorite author list comprised my summer reading. MC: When I have time to join my husband on the links, I play golf (started playing when I was ten!). I also spend the summers swimming and doing water aerobics. Must be my Pisces birth sign that draws me to water. I also love watching my beloved Indiana Hoosier basketball team. Being raised in Indiana, basketball is practically a religion. MC: Dove Dark Chocolate, Hershey’s Dark Chocolate with Almonds, Dove Dark Chocolate and Salted Carmel, and several cans of Rotel tomatoes (they make any recipe better!). MC: Definitely! I’ve already started Book # 2 in the Andi Anna Jones series, and I’m tweaking my middle-grade series, The Adventures of Max & Maddie. Two other adult mysteries are in the works, along with a biography. Now, to find the time to write!